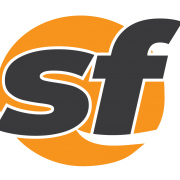 Mayor London Breed included $5.8 million in The City’s two-year budget to help provide funding for the voter-approved Proposition F, which asks The City to establish and fund a program to provide legal representation for tenants facing evictions. 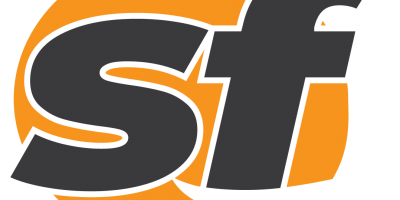 Approximately $1.9 million is allocated in the 2018-2019 fiscal year, and $3.9 million in 2019-2020. Breed signed The City’s two-year budget last week. Breed, who has been a renter all her life, said she knows some of the stress tenants face. Her building was sold several years ago and it was unclear what would happen to her and the tenants living in the building. Breed said the housing shortage is driving up the prices of homes, and it incentivizes landlords to evict tenants. 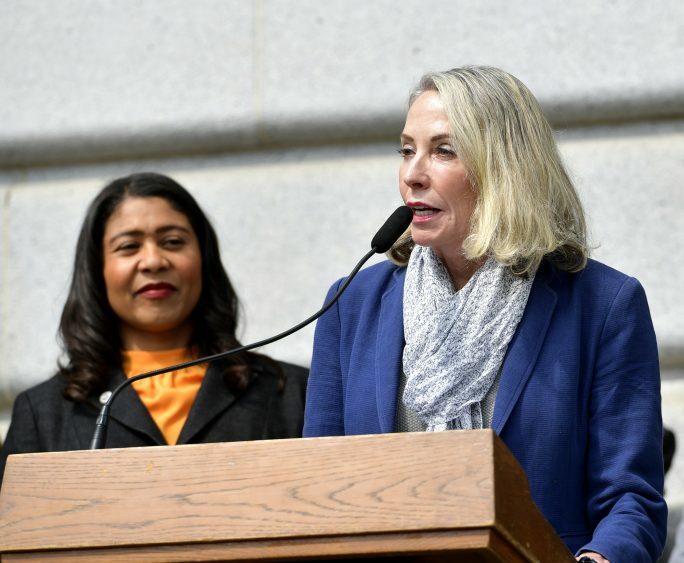 San Francisco Supervisor Vallie Brown, right, speaks at a press conference announcing adding funding for tenant legal services outside City Hall in San Francisco, Calif., on Wednesday, Aug 8, 2018. Brown said her office will explore expansion of rental subsidy programs and expanding The City’s Small Sites program, which helps purchase properties where long-term tenants are vulnerable to evictions. Just last week, The City announced the purchase of a property at 4830 Mission St. where 21 residential units and six commercial storefronts will remain affordable for tenants at the property. 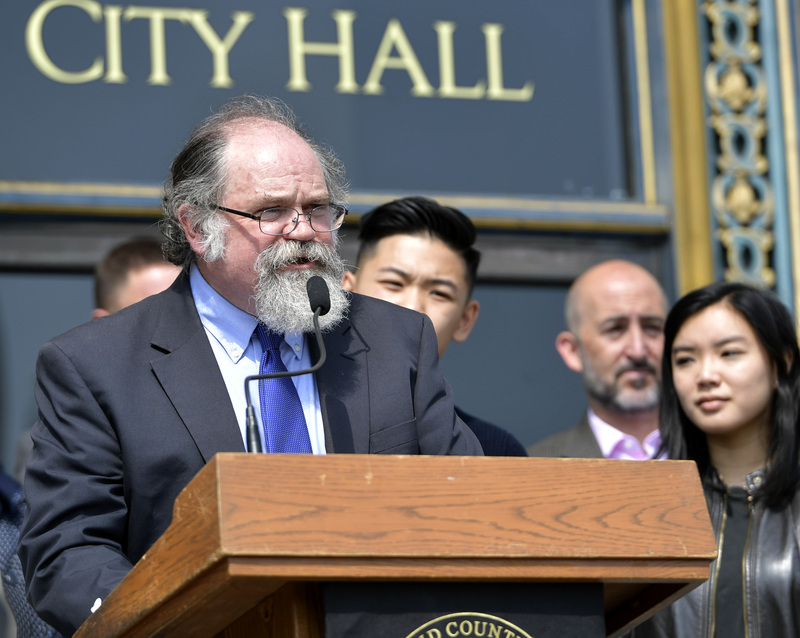 Tom Drohan, a supervising attorney at Legal Assistance to the Elderly, speaks at a press conference announcing adding funding for tenant legal services outside City Hall in San Francisco, Calif., on Wednesday, Aug 8, 2018. Tom Drohan, supervising attorney Legal Assistance to the Elderly, said at least 60 percent of calls coming into the office are seniors in distress who have received an eviction notice from their landlord. One of those tenants that Drohan helped was Virginia Florendo Wong. Wong’s landlord accused her and her husband of owing money. Drohan was able to fight the accusation and was the case was dismissed. 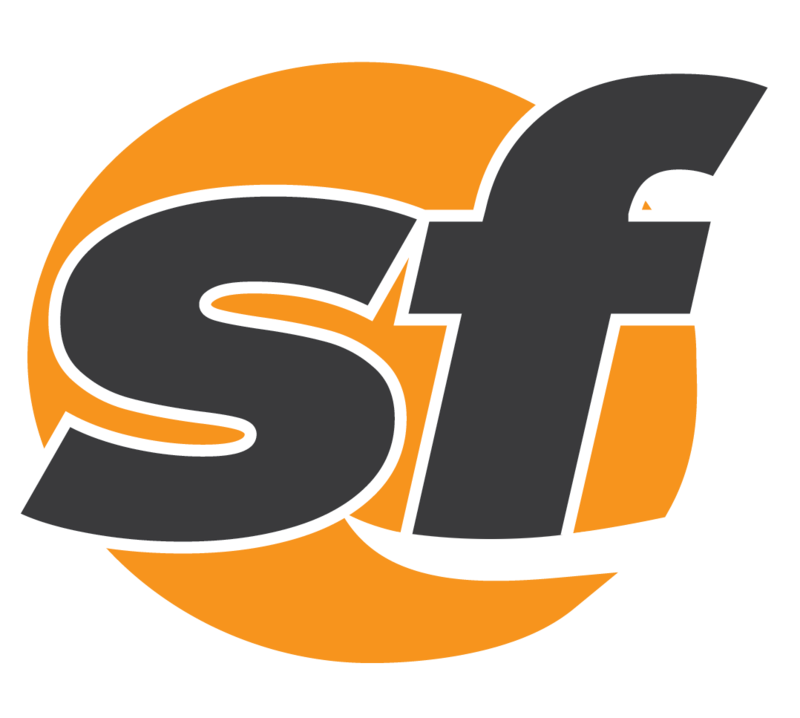 During the press conference at City Hall, the San Francisco Democratic Socialists of America voiced concerns over comments by Breed last year about the Proposition F ballot measure. Breed as supervisor last year had said the ballot measure was a “waste of time,” but had been working instead on similar legislation with former Supervisor Jeff Sheehy. The group is also calling on Breed to support the ballot measure Our Home, Our City, which would tax corporations making $50 million or more with a homelessness gross receipts tax in The City that would help fund more housing and provide additional legal services to those facing evictions.